Kofi Annan, President of the Global Humanitarian Forum, was yesterday joined by Mélanie Laurent (star of Quentin Tarantino’s ‘Inglourious Basterds’) and David Jones (Global CEO, Havas Worldwide) for the launch of a specially re-recorded version of Midnight Oil’s Beds are Burning as a global musical petition to demand climate justice at the UN’s Copenhagen Climate Change Summit in December. ‘Beds Are Burning’ was produced by The:Hours, and is to be made available on all major music download platforms for free. It will also be available on the campaign’s own website: www.timeforclimatejustice.org. The song has been supported by over 60 international music stars and celebrities including Duran Duran, Mark Ronson, Jamie Cullum, Melanie Laurent, Marion Cotillard, Milla Jovovich, Fergie, Lily Allen, Manu Katche, Bob Geldof, Youssou N’Dour, Yannick Noah and many more. “Climate change is the greatest humanitarian challenge facing mankind today,” said Kofi Annan. "And it is a challenge that has a grave injustice at its heart. It is the major developed economies of the world which contribute the overwhelming majority of global greenhouse emissions. But it is the poorer and least developed nations that are hit hardest by its impact. “By downloading ‘Beds Are Burning’ for free from major music download platforms on the internet, people from around the world will be adding their names to this growing global petition – joining the campaign for climate justice and becoming a climate ally. 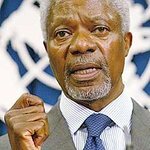 Founded in 2007, the Global Humanitarian Forum is led by Kofi Annan and brings together stakeholders, including government, business, international organizations, civil society and the general public, to help solve humanitarian challenges. Located in Geneva, the Forum’s current focus is to increase awareness on the human face of climate change and to boost support to vulnerable populations worst affected by global warming. “The next Kyoto agreement is hugely important to get right because the last one got it so wrong,” said Melanie Laurent. "The single greatest contribution to the levels of greenhouse gases in the atmosphere is not the burning of fossil fuels by the transport sector, nor is it industrial pollution, it is deforestation. Every download will count as a unique digital petition with people adding their names to demand world leaders reach an ambitious, fair and global deal at the UN Climate Change Summit in Copenhagen. Already, more than 1.3 million people have signed up to the campaign.